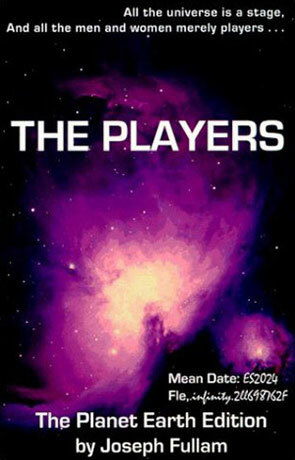 The Players is a science fiction novel by Joseph Fullam. I accepted getting a review copy of this book after having having read the byline which says "All the universe is a stage, And all the men and women merely players...". I must have thought that that sounded intriguing or something, but this line also sums up what wrong with this story. Lets take a closer look at it: "All the universe is a stage". That's okay, it tells us that there's something larger (a director), somebody in control (a producer? ), somebody (actors/players) trying to convince somebody (the audience) of something that may and may not be the truth. How about "...is a stage, And all...", well, I'm in no way a Master of English grammar, but I seem to remember that one does not capitalize after comma. The thing is The Players could have gained a lot from stronger editing. The last bit "...all the men and women merely players..." is where it cracks for me. I do not understand what the "merely" is doing there – think about it... what more can you hope to be in a stage-production? The director? The producer? Well, maybe, but there can only be so many of them. The point is, I would rather be a player than, just one of the audience, when it comes to the production of the great The Universe play. At least the players get a copy of the script and a clue. My guess is that it should have read "and all the men and women are merely pawns to be played". Or something equally ominous. And yes, I'm aware that it's a qoute from Shakespeare, but that doesn't make it any more fitting. Anyway, the point is that I never really found the stage, or even the theater where the play of this book took place. There was a couple (like two) nice ideas, but the rest of the story was just a meaningless jumble of words to me. The gigantic universal theater where men (and women) are merely players (or pawns), somehow escaped me and I found no justification for either the title nor the byline. Luckily it's only a hundred and fifty pages and so, the time wasted was easily made up by the fun I had writing this review. Written on 21st January 2001 by TC.